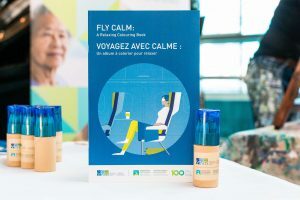 In partnership with the Canadian Mental Health Association (CMHA) BC Division, the Fly Calm initiative has been introduced at YVR. The launch of the initiative on October 10 coincided with World Mental Health Day and included a host of new resources, including an interactive website with several videos, as well as an on-the-go colouring book to help travellers de-stress before a flight. YVR has been working with the CMHA BC Division since April 2017, including the organization’s national “Ride Don’t Hide” fundraiser to raise awareness and combat stigma associated with mental illness. Earlier this year, YVR employees, along with other riders from across Canada, helped raise more than $1.8-million for the Canadian Mental Health Association’s community-based programs and services. Partnerships such as this are part of YVR’s commitment to bring social benefits to the communities the airport serves. The airport’s community investment program has three key areas of focus: Accessibility, Community and Environment. In 2017, YVR donated more than $1-million to more than 50 organizations that created innovative programs in their communities. The Fly Calm initiative colouring books and pencil crayons are now available at all pre-security Customer Information Counters at YVR or for download at flycalm.ca.